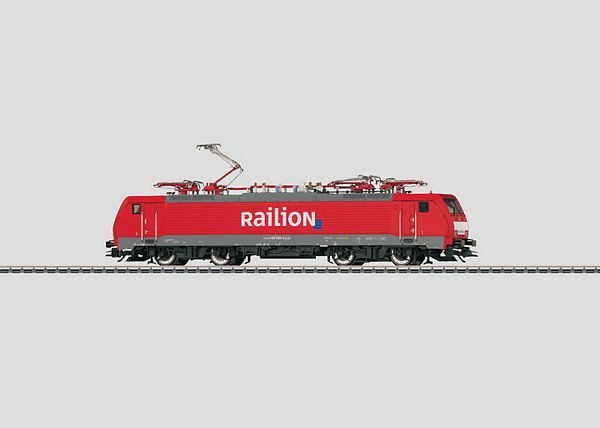 Prototype: German Railroad, Inc./Railion (DB AG) class 189 fast general-purpose locomotive. Multiple system locomotive with 4 pantographs. Version for service into the Netherlands with warning and contrast areas at the ends. Use: Fast cross-border freight trains. Model: The locomotive has an mfx digital decoder and a sound generator. It also has high-efficiency Softdrive Sine propulsion and a compact-design, maintenance-free motor. 2 axles powered. Traction tires. The triple headlights (warm white LEDs) and marker lights are maintenance-free LEDs, they will work in conventional operation, and can be controlled digitally. The engineer's cabs have interior details. The locomotive has separately applied grab irons. Length over the buffers 22.5 cm / 8-7/8.